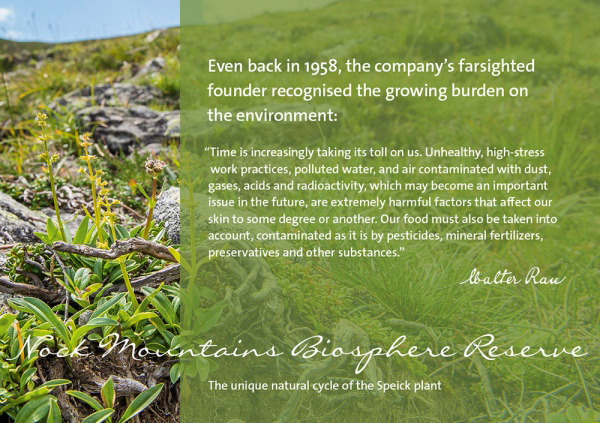 The observations of SPEICK's founder, Walter Rau, sound like an analysis of current environmental damage. But he was already saying these things back in 1958. This awareness was enough to motivate Rau to develop natural cosmetics. SPEICK's goal remains the same today: To develop natural cosmetics that nourish and care for the health, vitality and natural beauty of every person. They use raw materials from biologically regulated cultivation whenever the quality and quantity is available. SPEICK are a founding member of the first German natural cosmetics certification system (BDIH). Their first products were BDIH-certified in 2001. Since 2014, newly developed products are certified by the international COSMOS standard. Since January 2017, the COSMOS standard for new developments is mandatory – this applies to all members of BDIH, Ecocert, Cosmebio, ICEA and Soil Association. Together, these organisations represent the largest global system for the certification of genuine natural cosmetics. Today, the large majority of products are certified according to the COSMOS standard. Behind SPEICK's products are real stories, such as the fascinating cultural history of the Speick (Lat. Valeriana celtica) medicinal plant. Ecology and regionality, sustainability and humanity – these values have played an important role at SPEICK natural cosmetics from the very beginning. A small family company, the factory is based near Stuttgart as it has been for over 90 years, with everything from one source – from product development to shipping. Today, SPEICK are one of the very few German soap manufacturers and still carry out some processes by hand, as they don’t want to leave each individual production process to machines. Environmental and social criteria play a key role in the selection raw materials and packaging. They aim to principally work with partners from the region to avoid long transport distances, as well as to strengthen the local economic system. SPEICK believe fair trade begins with them.